Pollen is a common culprit behind allergies, but there are quite a few other substances that can cause a similar response, such as dust mites and pet dander. When you’re allergic to any of these airborne substance, your body responds by releasing a chemical that causes congestion, a runny nose, sneezing, and watery eyes. However, that isn’t all that happens. Many folks who suffer from allergies find it difficult to sleep at night. 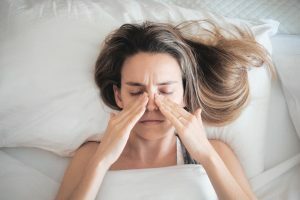 This is in part due to the discomfort that comes with sneezing and other nasal issues, but it may also be due to obstructive sleep apnea (OSA). People with OSA periodically stop breathing at night because tissues in the throat collapse, blocking airflow. Allergies may worsen or even cause OSA because nasal congestion causes the upper airway to become narrower than usual. If you regularly suffer from poor quality sleep, your daily life may become difficult due to excessive fatigue and trouble concentrating. You are even at a greater risk for serious health conditions, such as cardiovascular disease. To prevent such problems, it is important that you take steps to address the issues that are disrupting your sleep. One thing you can do is visit your physician and ask for advice on how to choose a medication to reduce your allergy symptoms. If your allergies are due to pet danger or dust, you may need to take some time to give your home a thorough cleaning. It’s also vital that you address your OSA. A simple oral appliance from your dentist in Lacey can gently move your jaw forward and help to keep your airway clear at night so you can enjoy deep, rejuvenating sleep. A CPAP machine is another common treatment for OSA, but it is usually not necessary in mild to moderate cases. Are allergies robbing you of precious shuteye? Please seek the help you need so you can get back to enjoying all the Zs you deserve. Drs. Venn Peterson and Spenser Cammack enjoy working together to provide comprehensive dental services to folks in the Lacey area. Unlike many other dentists, they even provide sleep apnea treatment in the form of custom oral appliances. If you would like to learn more about how you may be able to benefit from OSA therapy, please contact our office at 360-459-4420.